Will living in Bengaluru ever be a cup of tea? Or coffee, if you will? Saturday, 4th August 2012, at 5 pm, Reliance Timeout, Mantri Mall, Malleswaram. R K Misra, member ABIDe, will release the book. Vatsala Dhananjay, well known lawyer, will talk about things to keep in mind while buying property in the city. In the past decade or two, Bengaluru has grown from a quiet, pleasant place to a vibrant and bustling city. Lakhs of new homes have been created, and millions of citizens from all over India have become part of the city’s growing economy. Schools, apartments, layouts, and swanky commercial complexes have mushroomed everywhere you look. With all these changes, the need for knowledge about the city and its systems has never been felt as strongly as it is now. From dealing with property matters to managing issues in apartments, from getting ID documents to understanding transport systems and more, Bengaluru’s citizens have to regularly navigate various complex hurdles! Often, the procedure of getting anything from the local government authorities, like birth and death certificates, is paved with bottlenecks. The myriad processes involved in simple government-related tasks can make one’s head spin…And actually knowing what to expect and what you need before you go to the government office is highly helpful, in getting things done in time and without a bribe. Living in Bengaluru ought to be easier, with no running around in confusion. This book is meant to help with exactly that, by demystifying the critical things that a Bangalorean needs. With step-by-step guides for essential processes like paying taxes, getting registrations, etc. along with eco-friendly tips for saving water, wallet-friendly tips for saving fuel, and time-saving tips for various city tasks, we hope this book will enable you to live smart in Bengaluru. Citizen Matters is Bengaluru’s own interactive news-magazine, launched in 2008 on the web at www.citizenmatters.in and then in print as a fortnightly in 2009, in South Bangalore. We have been tirelessly reporting and commenting on this city with hard-hitting as well as humorous anecdotes, stories, blogs, citizen updates, tweets, Facebook posts, events, meetings, debates and more. Our environmental focus has been much appreciated by our readers, and we have won various accolades for our work both in the city and internationally. Citizen-friendly initiatives have always been the heart and soul of our work. The media’s role in society-amongst other things-is not only to report but also to explain. As part of our commitment to covering Bengaluru’s affairs, we have produced guides and articles in the past, to address various questions and concerns that crop up, when living in this vibrant city. All the material-in our magazine as well as in this book-has been created especially for the Bangalorean in you. This first book from Oorvani Media, the publisher of Citizen Matters, is a collection of guides and tips that we hope you will find useful. If you like this book, we would love to hear back from you. If you dislike something in it or if we’ve gotten something wrong, we’d love to hear that too! Send your feedback to feedback@citizenmatters.in and we will reply within 48 hours. 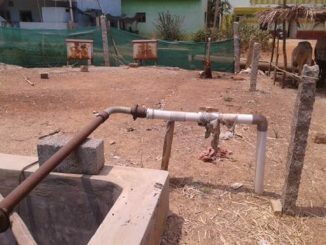 In a water-deficient village just outside Bengaluru, a household is treating and reusing the ‘grey water’ of the entire village to grow its kitchen crops. Parimala S highlights the process and what can be done to make it more efficient. We will keep posting update information as and when available. Can you please let me know where I can purchase this book in Bangalore?